I arrived home last week to find a package had been delivered. As I opened the bubble wrap envelope and tipped the contents out, my eyeballs bulged and a let out a low pitched "ooooh" that then turned into a weird low pitched ooh and laugh combined where I ended up sounding like a very masculine owl. You know the one "ooh-hoo-hoo-hoo". 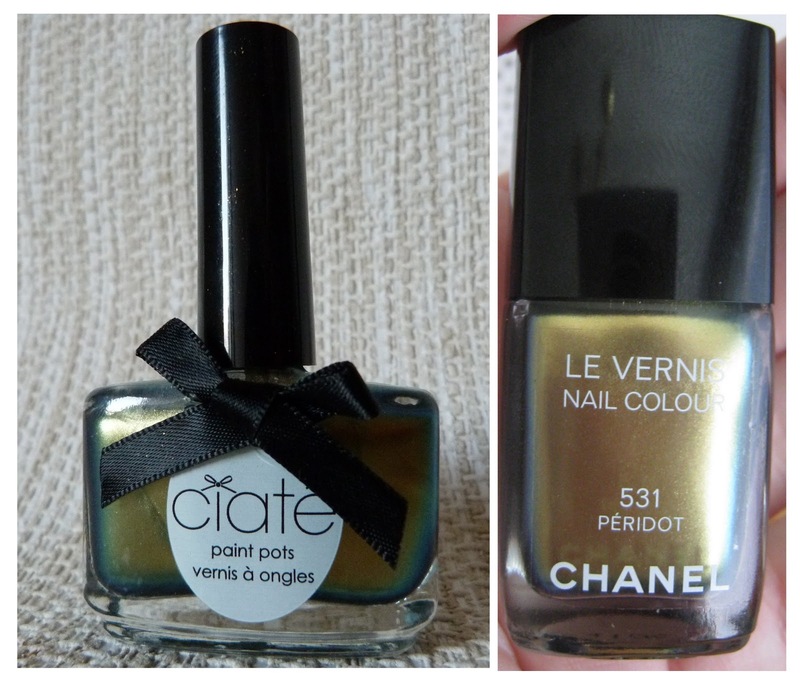 Yep, that's what gorgeous polishes do to me and they're that gorgeous that each one will be getting it's own post. Part of Ciate's summer collection, Oil Slick is an absolute stunner and it seemed that Twitter agreed when we posted a Twitpic of Joanne's Ciate adorned nails. Lots of our followers expressed their love for them and here are some lahffly photos for your viewing pleasure. This is one of those "dangerous polishes" I've spoken about in the past and when I talk about danger, I'm talking about trying to drive and not look at my nails glinting in the sunlight. Because this is one of hose duochrome polishes, you can't help but to admire your nails and tilt them in different directions to see it change colour before your eyes. Below is Oil Slick in the sunlight, it's a beaut. I used three coats of this but could have stopped after two. It's not streaky and dries with a lovely shiny metallic finish. 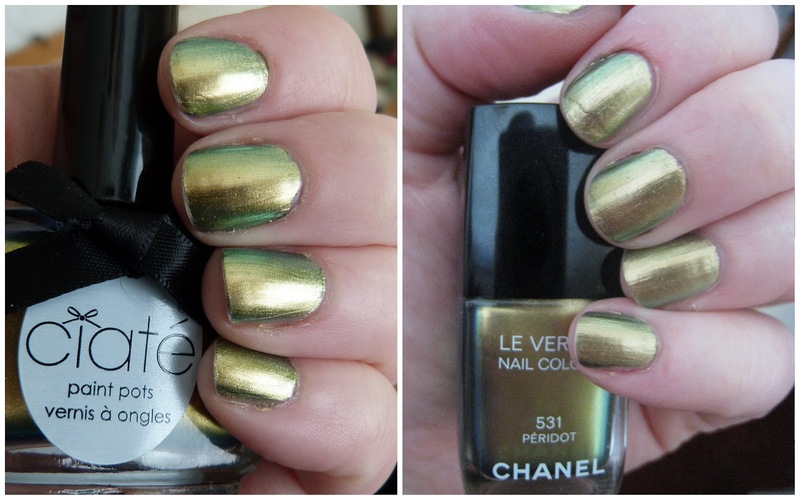 Now, the all important question, is it a dupe for Chanel's Peridot? Let's investigate shall we? Now, I need to tell you that I can't actually lay my hands on my Peridot at this moment in time... I can see it in my mind's eye but it's nowhere to be found, so I'll be comparing with last year's photos when we bought Peridot. Side by side in the bottle, Oil Slick seems to have more blue and green to it around the edge of the bottle. On the nails (and there's a year between these two photos!) 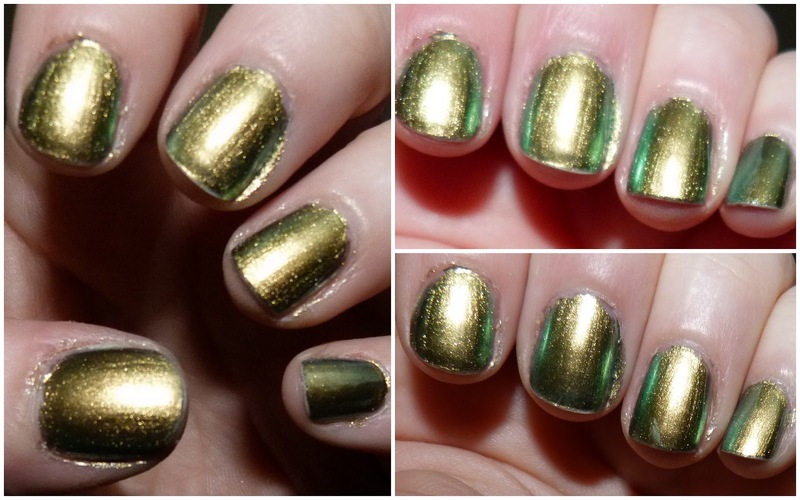 you can see the green around the edges of the nails that have Oil Slick on them more so than on my Peridot hand. Finish wise though, they look close enough although I think Peridot might have a bit of a smoother finish to it. They both have that same multidimensional aspect to them that will get people talking and taking that second look at your nails to see if they just changed colour in front of their eyes! Call it your party piece! If you own Peridot do you need Oil Slick? No. If you want a pretty great dupe of Peridot and want to save a few bob, will Oil Slick do? Absolutely! 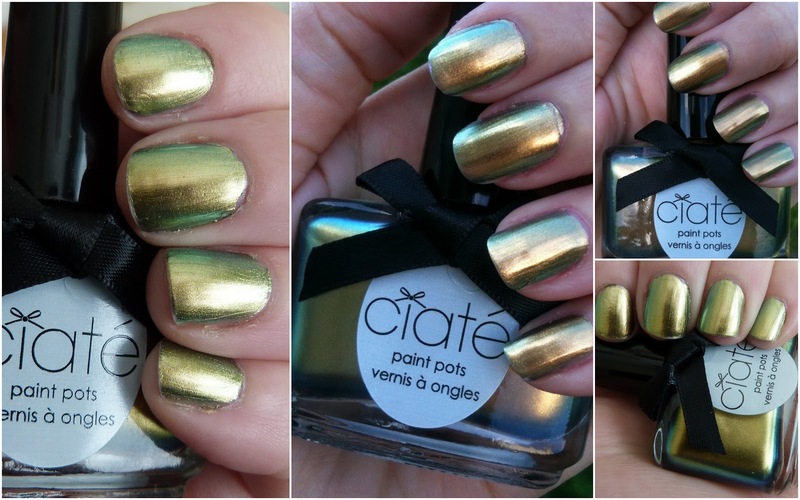 Ciate Oil Slick is available at McCabes Pharmacy and Sam McCauley Chemists and nationwide for €10.50. 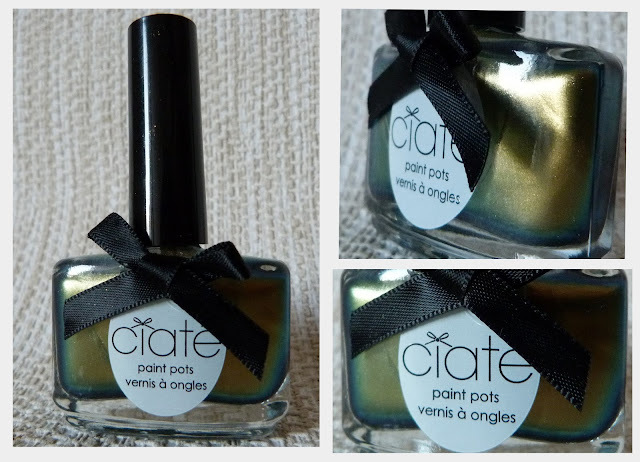 We absolutely love Oil Slick in Casa Girlie Bits! Me too, the little bows are too dinky! You're not weird at all Nina, you're a perfectly normal mad beauty blogger ;) If I'd had the cashola I totally would've bought all three magazines, sure CherrySue did!! 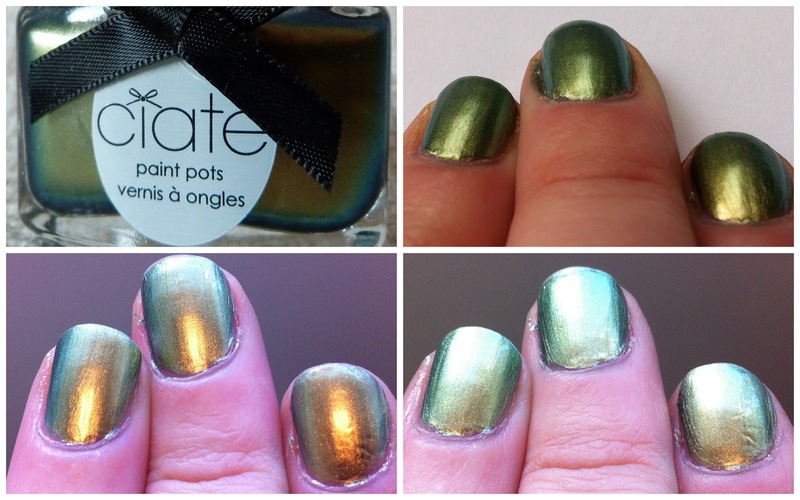 Oh it really is a stunner, I'm in the love with Ciaté already, their bottles are so pretty and are the ergonomic shizz for painting nails with ease. I have Peridot so won't spring for this but I WILL be checking out their other colours following my grá for the ones already in my collection! You legend! I've been trying to find out where I can get my hands on Ciate without ordering online (p&p is something mental like 16 sterling), off the McCabes I go! This polish is gorgeous. oooh this is really pretty!